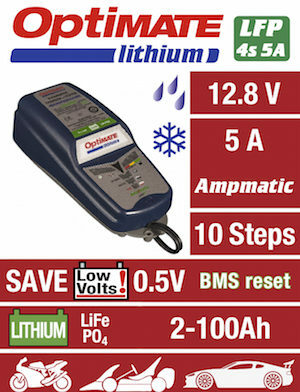 OptiMate™ lithium, the first OptiMate to protect your LiFePO4 battery in a way noother charger did before! 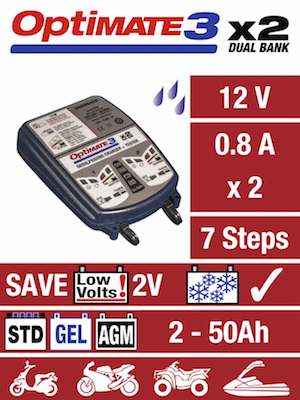 The new OptiMate lithium will protect your investment and guarantee your Lithium Iron Phosphate (LiFePO4 / LFP) battery will perform as advertised for a very long time. 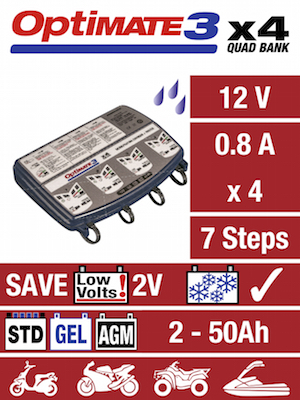 With 5 Amps of charge current available OptiMate lithium unique multi stepampmatic™ program recharges and balances cells within the battery quickly and efficiently. OptiMate lithium’s maintenance program delivers current to the vehicle circuitry, protecting and keeping the battery at 100% charge. 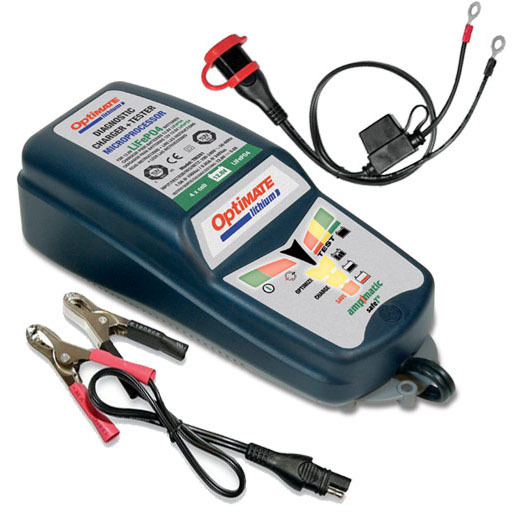 SKU: TM-290 Category: Battery Chargers Brands: Optimate. OptiMate lithium, the first OptiMate to protect your LiFePO4 battery in a way no-other charger did before! The new OptiMate lithium will protect your investment and guarantee your Lithium Iron Phosphate(LiFePO4/LFP) battery will perform as advertised for a very long time. 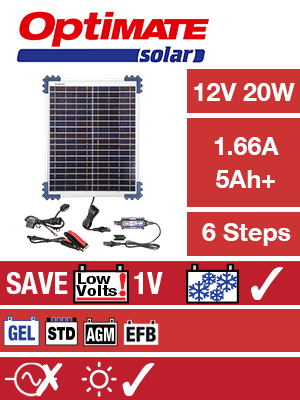 With 5 Amps of charge current available OptiMate lithium unique multi step ampmatic program recharges and balances cells within the battery quickly and efficiently. 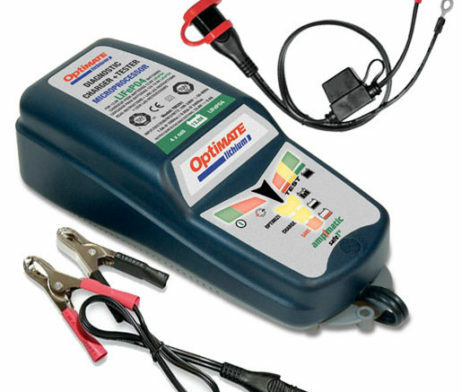 OptiMate lithium’s maintenance program delivers current to the vehicle circuitry, protecting and keeping the battery at 100% charge. Pre-qualification test: OptiMate Lithium displays the condition of the battery before charging and measures environment temperature. 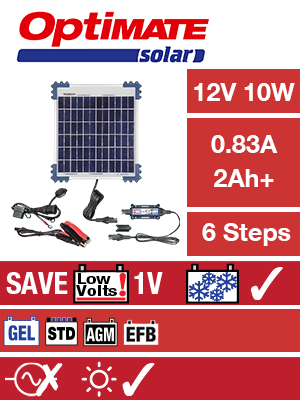 The ampmatic™charge program is selected according to temperature and battery condition. Low Volts recovery: The safeTº protection mode controls charging during this sensitive battery SAVE stage, to ensure that an over discharged battery will be correctly and safely recovered. Tests are conducted through-out the SAVE program to determine if the battery has successfully recovered and can advance to BULK CHARGE. Bulk charge: the ampmatic™ processor actively adjusts charge current to match battery capacity and condition, achieving a complete charge in the shortest time. Progress is tracked against the ideal charge curve for LiFePO4 batteries. Absorption and equalisation: for 10 minutes the current is delivered in pulses with voltage controlled between 14,0 and 14,3V, aiding cell voltage equalisation and improving the battery’s overall power delivery. Charge verification: the voltage is limited at 13,6V while the ampmatic™processor monitors the current absorbed by the battery. If this reveals a less than optimal charge, the program reverts to absorption for a further 10 minutes. Voltage retention test: is conducted for 30 minutes during which no charge current is delivered, with 5 possible test results indicating the battery’s general state of health. A green (voltage > 12,7V) result extends the test up to 12 hours, to check for excessive self discharge or higher than expected power loss through the vehicle’s electrical system.